Believing they had no other option, an elderly couple abandoned their 13.5 year-old dachshund outside Baldwin Park Animal Shelter in California, leaving a truly heart-breaking note to explain their choice. Toby Wisneski of Leave No Paws Behind rescued the dog, naming the senior canine Harley, and documenting what happened next on the groups Facebook page. Leave No Paws Behind is a rescue organization that specializes in senior dogs and in helping owners in financial trouble. Wisneski says the note “just rips your heart.” She knew there had to be more to the journey, and so LNPB began to spread the story through local news and social media, hoping to find and help the owners. It was apparent to the rescuers that this little dog had been loved and cared for throughout his long life, so they concluded that the owners must have fallen on hard times. Just several days after the media blitz began, his owners made contact. They told the rescue the little guy’s real name was Otto, and explained that the shelter was not their first choice. On a short visit to California, the dog became very ill, and his pet-parents feared his time had come. They took him to a local vet where they were prepared to put him to sleep and were giving Otto final hugs and saying goodbye, telling him how much he was always loved and how desperately he would be missed. But the real tragedy in their story was just unfolding. Because they didn’t have enough money to get him treated or to pay for the cost of having him humanely euthanized, they were turned away after being told they couldn’t leave him there. In tears and nearly hysterical, the gathered up their dog and with broken hearts took him to the shelter. 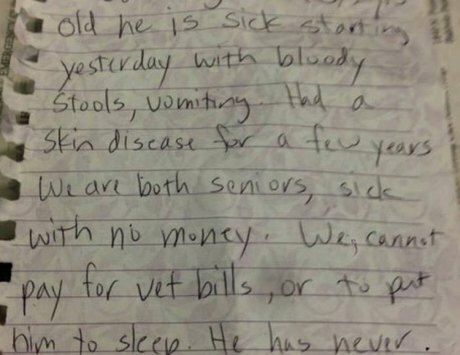 Believing it was their only option for their beloved pet, they left him there with the note. Otto’s family came forward to claim him because their love for him outweighed their fear of how people would judge them for the difficult choice they made. In the days after they left him, they had prayed, asking for guidance and comfort. The dog’s medical records show that he was well-treated and regularly cared for. When the economy took a dive, his owners could no longer afford the treatments he needed, and were unable even to afford their own medical care and medications, living week-to-week. Their long-time vet had told them the dog’s skin condition couldn’t be identified and expensive tests were needed. Vets at East Valley Veterinary Clinic were consulted by Leave No Paws Behind and had better news, saying Otto’s skin condition is treatable, and other age-related health issues like arthritis will be manageable with a little time and money. The rescue organization is stepping up to be sure Otto gets all of the help he needs. Despite what we often think, not everyone who leaves a pet at a shelter does so out of choice. The rescue made an easy decision to reunite Otto with his owners. Thanks to this true kindness of strangers, a tragic story ends with a family back together. After more information about the original owners of Otto was revealed the decision was made NOT to reunite him with his original owners. We have been informed that he has sadly passed away while in foster care where he was loved and being cared for.